Meet Your Police is a Huntington Park Police Department Program designed to strengthen the partnership between community, police, and your City Council members by providing an open forum for members of the community to exchange ideas, ask questions and interact directly with their Police Officers and City Council. We provide pastries, snacks, coffee and water at each meeting. The Los Angeles Homeless Services Authority announces the opening of the 2018-2019 Winter Shelter Program. Winter shelters provide shelter, warmth, food and comfort to homeless individuals during the cold and wet weather season. In addition to temporary emergency shelter, each program location provides access to supportive services and housing assistance. The Los Angeles Homeless Services Authority coordinates the Winter Shelter Program in partnership with the California National Guard, the County of Los Angeles, and the City of Los Angeles. About the Los Angeles Homeless Services Authority (LAHSA): The Los Angeles Homeless Services Authority (LAHSA) is a joint powers authority of the city and county of Los Angeles, created in 1993 to address the problems of homelessness in Los Angeles County. LAHSA is the lead agency in the HUD-funded Los Angeles Continuum of Care, and coordinates and manages over $300 million annually in federal, state, county, and city funds for programs providing shelter, housing, and services to people experiencing homelessness. The Huntington Park Police Department has been awarded a $70,000 grant from the California Office of Traffic Safety (OTS) for a year-long enforcement and public awareness program. The traffic safety program is intended to educate the public on safe roadway habits and deter people from violating traffic laws or practicing other unsafe behaviors that lead to injuries and fatalities. The grant from OTS will fund various education and enforcement activities for the 2019 federal fiscal year (Oct. 1, 2018 to Sept. 30, 2019). • DUI checkpoints and saturation patrols to take suspected alcohol/drug-impaired drivers – and those unlicensed or with a revoked/suspended license – off the road. 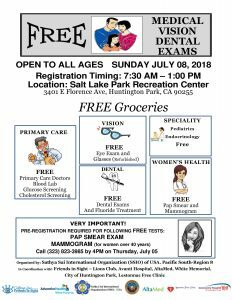 • Traffic safety education presentations for youth and community members on distracted, impaired and teen driving, and bicycle/pedestrian safety. • Patrols at intersections with increased incidents of pedestrian and bike collisions. • Checking for seat belt and child safety seat compliance. • Motorcycle safety operations in areas with high rider volume and where higher rate of motorcycle crashes occur. • Speeding, red light and stop sign enforcement. • Specialized DUI and drugged driving training to identify and apprehend suspected impaired drivers. 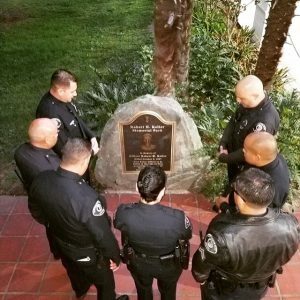 On this date in 1967, the Huntington Park Police Department lost one of its own in the line of duty. 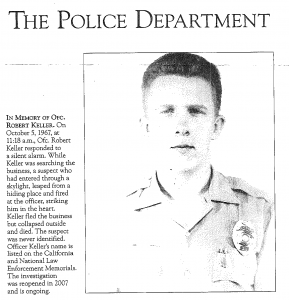 Today, we remember Officer Robert Keller for his sacrifice and dedication to this great city. Only Safe & Sane Fireworks are permitted on the 4th of July between 10:00 AM to 10:00 PM. All Sane & Safe Fireworks MUST have the State Fire Marshal Seal. To report the use or sale of illegal fireworks, please contact the Huntington Park Police Department at (323) 584-6254. HUNTINGTON PARK, CA — On June 17, 2018, Huntington Park Police Officers, in full-tactical gear, were assembled at the intersection of Florence Avenue and Pacific Boulevard, monitoring a large gathering of pedestrians and vehicles participating in an unruly spontaneous street celebration following the conclusion of the Mexico vs. Germany World Cup soccer match, in which Mexico secured a victory. While officers were monitoring the increasingly hostile crowd a suspect in the crowd fired upon the officers with highly explosive mortar style fireworks. Only due to evasive actions were the officers not struck by the projectiles. The same suspect was also observed firing mortar style fireworks directly at a law enforcement helicopter. 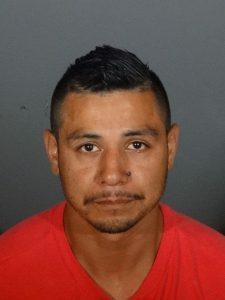 The suspect – later identified as Jose Alberto Martinez, 36 years of age – was located by Huntington Park Police Officers shortly after the incident and was arrested on various felony charges. The actions of the suspect were captured on cell phone video by spectators. The video footage circulated on various social media platforms and also received local media coverage. On June 22, 2018, the Los Angeles County District Attorney’s Office filed four counts of Penal Code 245(C) PC (Assault upon peace officer) and one count of Penal Code 18780 PC (use of destructive device and explosive to injure/destroy). The suspect is currently housed at the Los Angeles County Jail and faces a maximum State Prison sentence of 27 years. 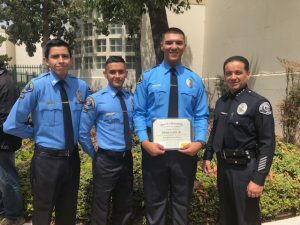 The Huntington Park Police Department would like to congratulate Edwin Cartin, Jr. who graduated from the Los Angeles County Sheriff’s Department’s Police Explorer Academy yesterday. Great job Edwin and welcome to our HPPD family. 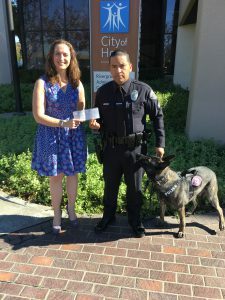 On Friday, December 8, 2017, Detective Miguel Fuentes and K-9 Kaz presented a check in the amount of $4,252.76 to the City of Hope on behalf of the Pink Patch Project. The Pink Patch Project in a collaborative effort with the Los Angeles County Police Chief’s Association (LACPCA) and over 260 public agencies across the nation raised a total of $700,000.00 to increase public awareness about breast cancer and to fight against the disease. 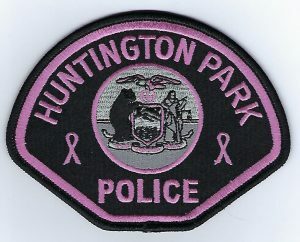 The Huntington Park Police Department would like to thank the Community and the Huntington Park Police Officers Association for the donations, dedication and hard work. A special thanks to Sergeant Abigail Valle for organizing and overseeing the project from the start. 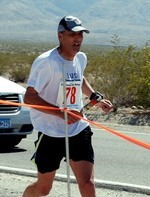 Chuck FooteThe Challenge Cup / Baker to Vegas Relay was the vision of Los Angeles Police Officers Chuck Foote and Larry Moore. It was spawned following the format laid by the LAPD Metro Division´s “Death Valley Relay” which came to an abrupt end in 1985 after a seven—year stint of running through the Devil’s graveyard. Chuck Foote, General Manager of the Los Angeles Police Revolver and Athletic Club, Inc. (LAPRAAC) and Larry Moore, LAPD Athletic Director, drove the course and over those long stretches of highway came up with the name for the race and its basic format. The first stop was Baker, California, where a short but very welcome visit with the Baker High School principal secured a home for the starting line. It was followed by a whistle stop in Shoshone and a friendship of over 20 years was begun with Robbie Haines. Then came Pahrump, Nevada, a town neither Foote nor Moore had ever visited but they knew runners passing through the night would wake someone up. They began to inquire whom to talk with about this event. Everyone said go see “Floyd” in the hardware store. Our relationship with Pahrump has grown about a fast as the city itself. The welcome the runners receive in Pahrump — the race´s halfway point — with coffee, water, cookies, the best smiles around and a great introduction by Alice Eychaner makes the city a pivotal part of The Challenge Cup / Baker to Vegas Relay story. The first Challenge Cup Relay start line was located on California Highway 127 in front of Baker High School. The finish line, as it was in 1985, was on Nevada Highway 160 at the intersection of Blue Diamond, 119 miles away and just 13 miles short of Las Vegas. At the conclusion of the first race all 19 teams gathered at the finish — and what a sight it was! Around 400 people standing in the desert dirt, next to a camper parked along the highway, participating in awards ceremony with then Los Angeles Police Chief Daryl F. Gates. Highway traffic was flying by but it didn´t matter. Runners were in their “own world” doing their “thing”. LAPD Central Division was the overall winner that year. Like a wild fire, the word began to spread throughout the country then the world. The Baker to Vegas Race became the police challenge. The 1986 Challenge Cup relocated the starting point 18 miles further up the road from Baker and the finish was moved to the Hacienda Hotel where the marquee read “Welcome LAPD Challenge Cup Relay — Finish Line”. It was “big time” Las Vegas style. The Hacienda Hotel´s Convention Center was bursting at the seams when over 2,000 runners, volunteers and spectators came to the Awards Ceremony. The race was in town just a few hours and already it had outgrown the Hacienda Hotel. Although the finish remained at the Hacienda until its demise in 1996 the Awards Ceremony moved about town like a hobo looking for a home. The 1987 Baker to Vegas Relay (as it is called today) was halted at Leg 14 due to “blizzard” conditions on Nevada Highway 160 over Mountain Springs Pass. This was also the first year of nine where the Sahara Hotel would be home to the Awards Ceremony. Needless to say once the race was halted many dejected people went home and only 2,500 attended the ceremony. LAPD´s Training/Air Support Division team won the race — they were ahead when the race was stopped and awarded the “short course” victory. A victory is a victory, or so the Los Angeles County Sheriff´s Department has been told (LASD was favored to win that year). The 1987 race is still talked about today as the most “infamous” victory. In December 2003, retired Officer Moore, a cornerstone of the race, died from injuries incurred from a motorcycle accident in the Las Vegas area. The race continues, as Larry would have wished. He was a great visionary and one of the hardest workers when it came to law enforcement athletics. Camaraderie, physical fitness and teamwork were his goals for this race. His vision continues to this day. The Baker to Vegas Relay is the most “positive” event offered to law enforcement officers today. It gives them a reason to maintain a physical fitness program so as to help them better perform their duties. Over the 20+ years the Challenge Cup/Baker to Vegas Relay has been run hundreds of thousands law enforcement personnel have tread across the desert. The original ideals of the race continue: teamwork, camaraderie, physical fitness and competition. The event has expanded in many ways — most notably in entries and categories. The number of teams has grown 14 fold from the first 19 teams in 1985. The number of teams is now limited to 270. Categories have grown to include Probation Officers, District Attorneys, US Attorneys and full time civilian police personnel. As a result of this growth the race has flourished. Today it is the largest law enforcement event of its kind in the World with teams participating from Calgary Canada, RCMP both men and women, Berlin and Hamburg Germany and law enforcement teams throughout the United States. The Challenge Cup/Baker to Vegas Relay is truly a National and International event. The Annual Challenge Cup/Baker to Vegas Relay is scheduled to take place (depending on Las Vegas accommodations) over a weekend from late March to early April. The course begins 25 miles north of Baker CA. on Highway 127 to Shoshone CA; then northeast on Highway 178, across the state line into Nevada on Highway 372 to Pahrump NV., then southeast on Highway 160 to the finish inside the Hilton Hotel Convention Room in Las Vegas. Teams are scheduled to run in eleven flights, depending upon their ability, with flights starting hourly from 9:00 am to 5:00 pm. On Sunday, eight hours after the last team finishes, an Awards Ceremony is held in the Hilton Hotel Convention room for over 6000 runners and support personnel; several thousand family members and friends; and almost a thousand race volunteers. The festivities began with a most impressive Opening Program providing entertainment for all. Over 145 VIP law enforcement dignitaries, chiefs of police, agents—in—charge and sheriffs are introduced to the crowd. During the ceremony and throughout the hotel conversation is continually in a roar with the most common phrase and pledge, “Wait till next year”! There you have it. The story of the largest police foot pursuit in the world. “The truth, the whole truth and nothing but the truth”. © 2019 Huntington Park Police Department	| Designed by Dhali.com.